I spoiled the mood. I was at a dinner with musicological colleagues and students after a meeting of the Southeast chapter of the American Musicological Society last spring. It was a lovely time—great food and conversation—but then someone thought to ask a question to the whole table: What is your favorite opera? Certainly Così is an example of what I would describe as the Disney Happy Ending Problem. All sorts of terrible, traumatic events happen in children’s movies; no matter how blissfully perfect the finale ultimo appears to be, it never seems to me to compensate for the kidnapping, the guardian’s death, the lonely wanderings (or whatever) of Scene 2. Granted, by the time we reach the end of Così, I’m not really enjoying it anymore—but I’d say that of just about every opera I know (Idomeneo being an exception in that regard). Hytner’s production does a good job of leaving the audience—or me, at any rate—with a lingering bad taste. As Mozart’s C major fanfares bellow in the pit, the four protagonists eye each other nervously. “Happily ever after,” perhaps, but it is no longer clear who belongs with whom. 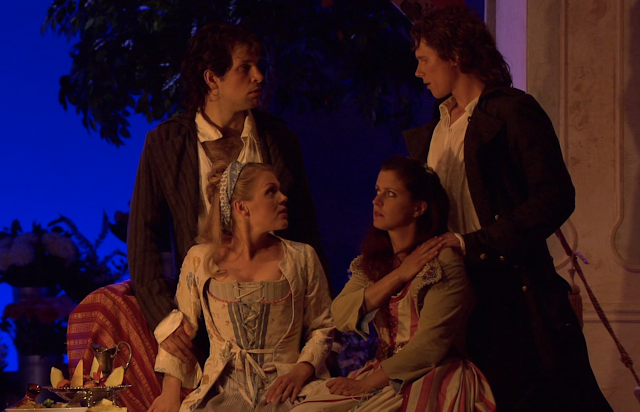 SOURCE: The original couples restored but confused: cropped screenshot from DVD of 2006 Glyndebourne production (at 2:56:58, during the orchestral conclusion to the Act II finale). One of the things that makes the ending so unsatisfactory is that we’ve hardly seen the “right” pairings of these couples, and—more than this—those “right” pairings are so musically wrong: the opera seria soprano Fiordiligi is not the fiancée of the romantic tenor Ferrando, but rather of the baritone Guglielmo; it is the buffa mezzo Dorabella who is engaged to the tenor. Our ears—or at least my ears—know that something is wrong with this. 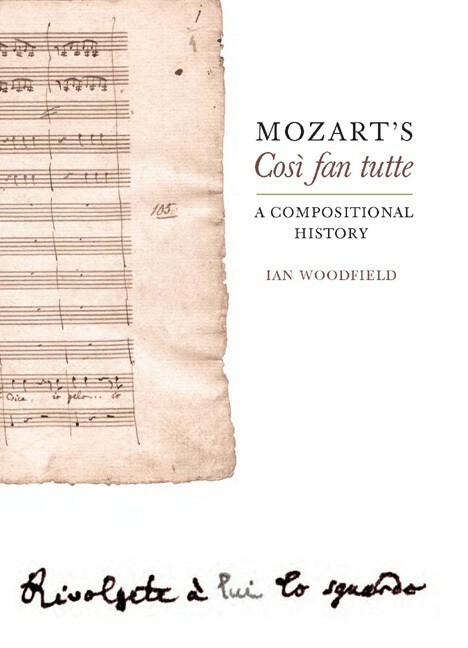 It was thus refreshing to read Ian Woodfield’s fascinating monograph Mozart’s Così fan tutte: A Compositional History. 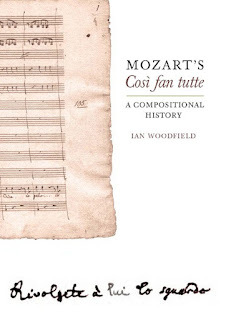 I read it when it came out in 2008, but have been eagerly awaiting a chance to re-read it, and teaching the work again this spring while also writing the blog prompted me to find the time to do it—and to have the (relatively inexpensive) facsimile of Mozart's autograph at my elbow. 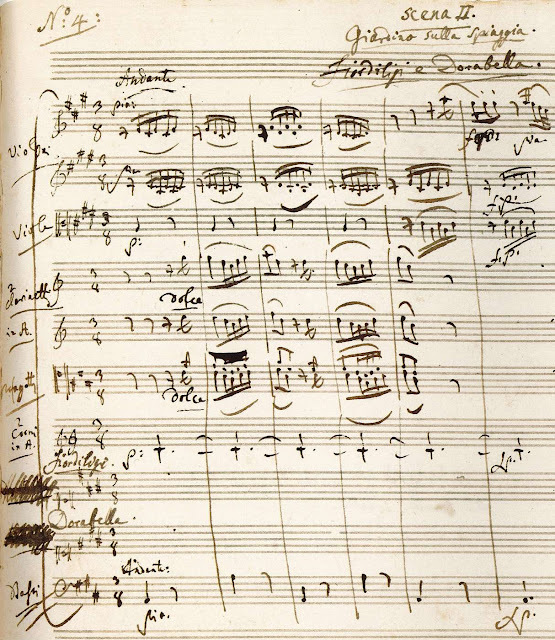 This is a great convenience, as the autograph itself is split between two libraries (Kraków and Berlin), and the facsimile includes also a scan of the original printed libretto and portions of a Viennese copyist manuscript. That is only a start, though, as Woodfield scrutinized twenty further copyists’ scores of the work. “Scrutinized” is a mild word to capture the intensity of Woodfield’s examinations, but the only way to appreciate that is to read the book. This sort of forensic study is not for everyone, but I would expect anyone who follows this blog would find it at least worth a try. That said, the conclusions Woodfield draws from this are earth-shattering. Of these, the most astonishing is that, at some point during their work on the opera, Mozart and da Ponte planned that the couples would not be switched—that the conditions of the bet would be that the guys would be compelled to seduce their own (rather than each other’s) fiancees. This is, of course, not the work as we know it. I suspect that it was an attempt to make the far-fetched plot seem a little more reasonable (not that that is a precondition for opera libretti...). We might be more willing to accept the women’s yielding so quickly to suitors physically like their boyfriends, but that would result in a dramatically much weaker second act. In the opera as finished Ferrando has to learn from Guglielmo that his side of the bet is lost, and we get two powerful reactions: Guglielmo’s misogynist rage (“Donne mie, la fate a tanti”) and Ferrando’s conflicted recognition that he loves her still, sadder but wiser (“Tradito, schernito”). If the pairs were not crossed, Ferrando would not need to be told anything (nor Guglielmo later), nor would the audience. It would be a recipe for tedium. 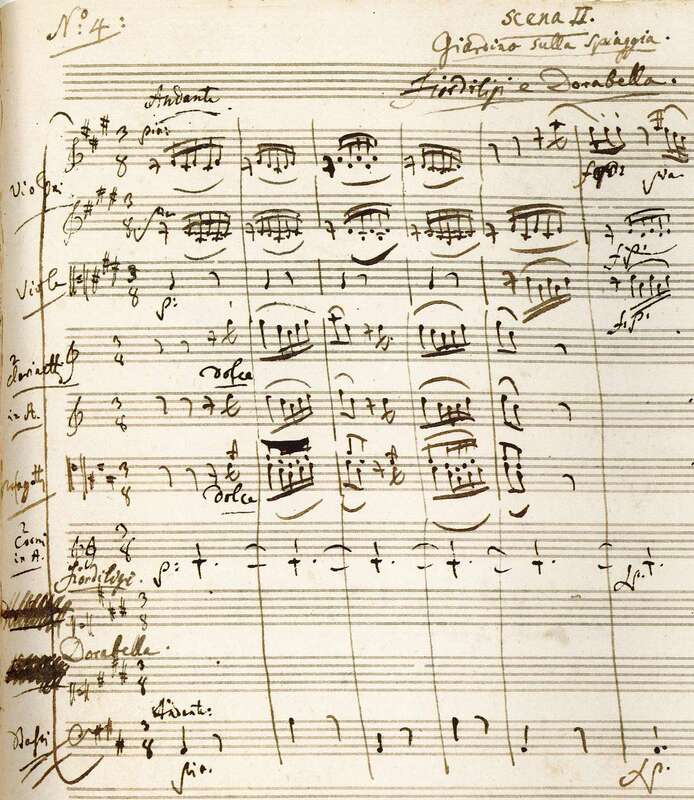 SOURCE: cropped screenshot of a page from Antonio Salieri’s attempt [La scola degli amanti], Austrian National Library, shelfmark Mus.Hs.4531, fol. 5. With Mozart’s(?) idea to revise the plot, these name-pairings remained the same—that is, Dorabella and Ferrando were paired (throughout, even with Ferrando in disguise)—and similarly Fiordiligi and Guglielmo. Leaving these couples together, though, made it necessary to switch the vocal types, with Dorabella as the high soprano and Fiordiligi as the mezzo. Evidence supporting this can be seen where these vocal parts have been reversed in the autograph (as in the example below in their first number (4), but nos. 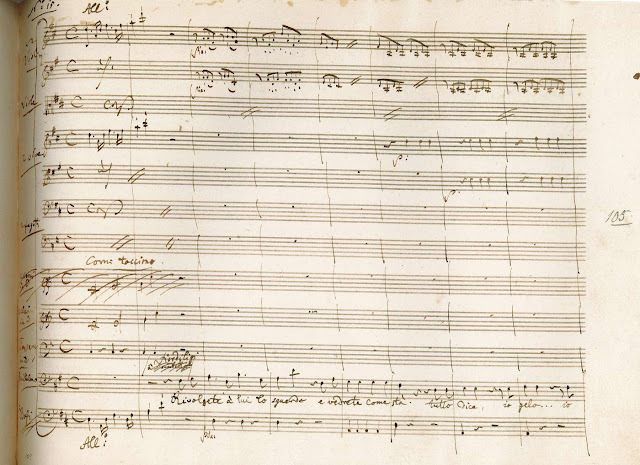 6, 10, and 13 have the same situation); also suggestive are places where lines given in the first edition of the libretto to one sister are set by Mozart for the other. 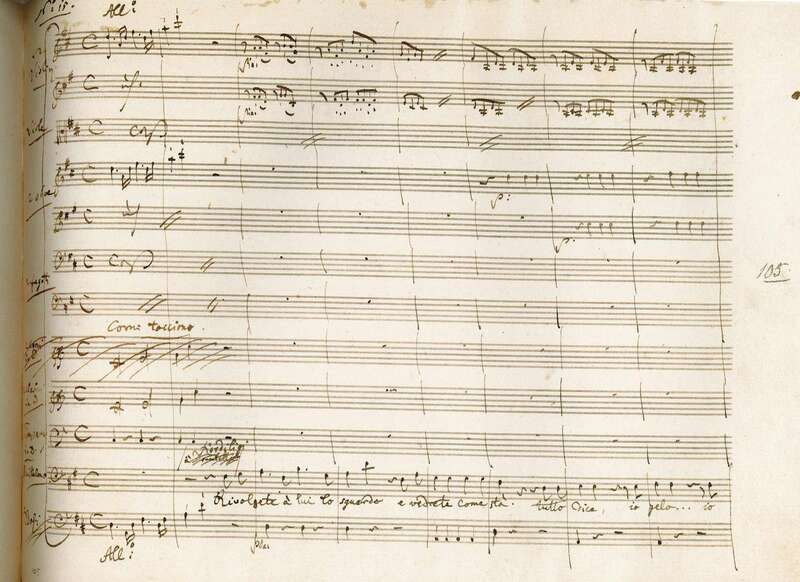 Woodfield’s scrutiny of the autograph score reveals Mozart’s considerable indecision at crucial moments. 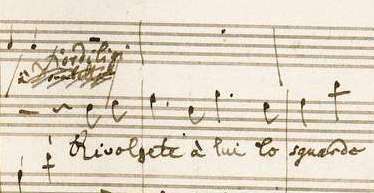 In the recitative below, there is a false start for Ferrando, then (after the new accolade with clefs) the same text allocated but given to Guglielmo, followed by Ferrando’s response, but which Mozart then struck through, reversing the order of the characters back to the original plan, and adapting the vocal parts accordingly. Looking more closely [detail at right], we can see that the aria was originally addressed to Dorabella, but her name has been scratched out and Fiordiligi’s superimposed. Beyond this, though, Woodfield notes the ink color of the word “lui” is different than the surrounding text. Mozart left the space for the pronoun blank for a while as he decided what Guglielmo was to say (and to whom). 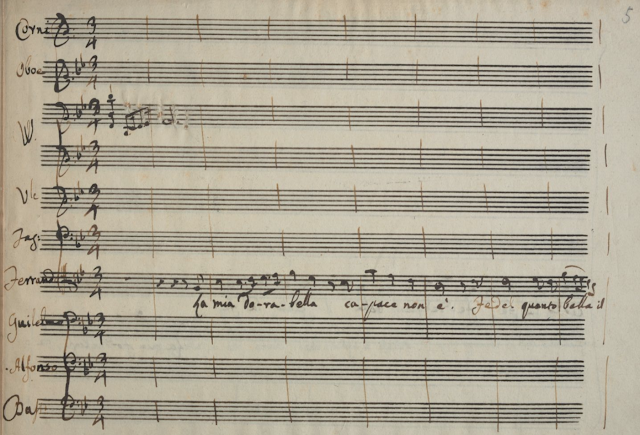 In the catalog listing, he says “Turn and look at me” (“Rivolgete à me lo sguardo”); but in the score he says instead “Turn and look at him.” Mozart’s omission of the pronoun allowed him time to figure out what would work best for the opera. Ultimately that was a restoration (apparently) to the criss-cross couplings, but it is fascinating to consider how different the work might have been. These are a few of the dozens of examples Woodfield musters to support his conclusions, and I cannot do justice to them in the small scale of a blog post—still less to his examinations of performing traditions in sources dating from the first few decades after the premiere. The work that resulted is not perfect. It bears the traces of Mozart trying to make changes as he went along, and then incompletely fixing them. (Fiordiligi’s first line of recitative, for example—“I’m ready for some mischief this morning”—seems more in character with her sister.) This is a problematic work, and Mozart struggled to bring it off. Given that Mozart fell in love with one woman and ultimately married her sister (to whom he was later to write about the necessity of her fidelity in preserving his honor), it wouldn’t be surprising if this plot hit particularly close to home. One reason I like teaching this piece is that I think it comes close to my students, too. Generally speaking, my students are still idealists, like the couples in this opera. I don’t like the plot of Così; I don’t like the situations the characters are put in. I understand why people don’t want to see it (and thus the howls of disapproval at an otherwise pleasant dinner last spring). It is an ugly story beautifully—though problematically—told. I can’t stand its title, which singles out women specifically and unfairly. It should be called Men behaving badly: their arrogance is the cause of all the heartache. I would settle for This is how people are. Any work with a title like that is bound to be a tragedy: da Ponte in bed with Voltaire. 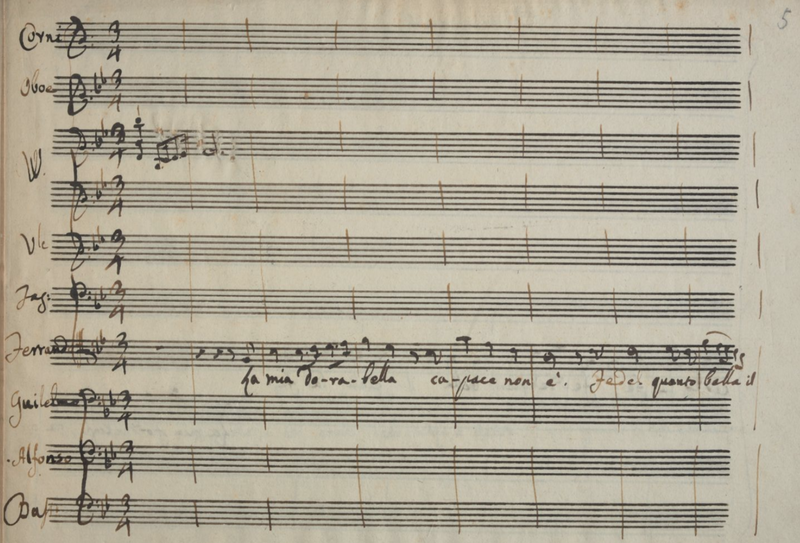 The textual situation of Così is a healthy reminder that (of course) all life is compromise: not just politics, but relationships too—and even art from as sure a hand as Mozart. The music is so beautiful, but it appears he didn’t get it to work out quite the way he wanted. Still, it’s so much better than nothing at all. That, too, is the lesson his couples have to learn if the ending is going to mean anything to us.